Danny Fisher interviews Dr. Jon Kabat-Zinn about his mindfulness-based stress reduction as “Buddhist meditation without the Buddhism”. 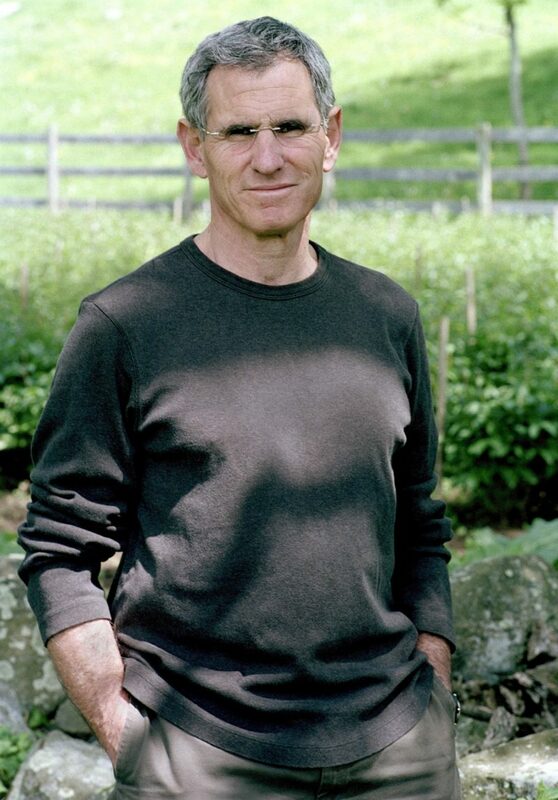 Professor of Medicine Emeritus and founding director of the Stress Reduction Clinic and Center for Mindfulness in Medicine, Health Care, and Society at the UMASS Medical School, Dr. John Kabat-Zinn is the most prominent figure in the introduction of mindfulness to the mainstream. Bill Moyers’s Healing and the Mind program helped introduce Americans to Kabat-Zinn’s Mindfulness-Based Stress Reduction (MBSR) technique, and Kabat-Zinn himself has done much to raise awareness of mindfulness’s value with gamechanging books like Wherever You Go, There You Are: Mindfulness Meditation in Everyday Life; Full Catastrophe Living: How to Cope with Stress, Pain and Illness Using Mindfulness Meditation; and Coming to Our Senses: Healing Ourselves and the World Through Mindfulness. And last night, Dr. Kabat Zinn kicked off National Breast Cancer Awareness Month at UCLA by headlining a benefit for the LA County affiliate of Susan Komen Race for the Cure. We spoke to him, last week, over the phone in an exclusive interview. Jon Kabat-Zinn: You understand that I myself am not a Buddhist, right? I don’t see what I do as Buddhism so much as I see it as Dharma expressing itself in the world in its Universal-Dharma-way. Well, that might be a good place to start. I know you have a history with…is it the Cambridge Zen Center? Yes. I’ve studied with a lot of different Buddhist teachers; still do. For a time I actually did consider myself to be a Buddhist. But I realized at a certain point that it was really most important for me to be a human—the fewer affiliations I had, the better. For me personally, that is. Also, I don’t think I would have been able to do what I did in quite the same way if I was actually identifying myself as a Buddhist; it inevitably would have been seen as Jon Kabat-Zinn trying to put his Buddhist trip over on other people. I wanted to offer instead a kind of translation of a universal understanding or approach that was never really about Buddhism. The Buddha himself wasn’t a Buddhist, and the term Buddhism is an invention of Europeans. And, of course, Buddhists could really care less because it’s all about non-duality: as soon as you start classifying Buddhists and non-Buddhists you’re not really a Buddhist anymore. I get quoted on these points a lot. All of this is just a way of giving you a background flavor of what it is that I do. Yeah, I have said that. I say those kinds of things a lot. It’s not meant to be disrespectful, in that anyone who knows anything about Buddhism will understand that it’s not about that—it’s about the Dharma. It’s about non-attachment to name and form, so to speak. I don’t know that it’s about getting past it so much as it is about going back to the beginning. 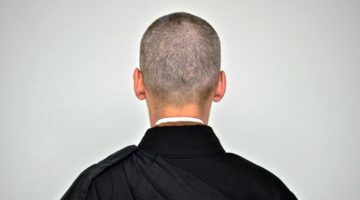 If it’s really all about mindfulness and suffering and the potential to relieve suffering and even the full cessation of suffering—liberation and deep understanding of the nature of mind—then if the “Buddhism” piece of it, which is very highly culturally-conditioned, gets in the way, that doesn’t serve the purposes of the Four Noble Truths. So the pathway I chose was to bring the essence or the heart of Buddhist meditation to mainstream of medicine in a way that would be so commonsensical that people would say, “Well, of course! Why didn’t I know this fifty years ago?” It was meant as a skillful means, not the complete Abhidharma or the complete essence of everything—because that essence is beyond words, and flowers in its own way in every single individual. From that point of view, we see our patients as Buddhas to begin with. It’s a question of them allowing the obscurations to fall away and becoming more familiar with their original nature, so to speak. Would you say something about your guiding principles in developing mindfulness-based stress reduction (MBSR) within the context of modern medicine? I know that sometimes things that come out of historically religious containers can be suspect—if not verboten—in that world. There certainly would be if you went in with a belief-base. In a medical setting, that would not be skillful. You need to reach 100% of people. MBSR really developed out of going around and talking to doctors in the hospital while I was working in the cell biology and anatomy department. This was 1979—so, thirty-one years ago. I was thinking, “I’m thirty-five. I really don’t want to be doing molecular biology research anymore; I want to do something that has to do with my meditation practice and bringing the Dharma into the world in ways that address the infinite levels and forms of suffering. The idea was, “Would it be valuable to the doctors and these patients if there was some kind of a safety net that would catch those people falling through the cracks of the healthcare system and challenge them to do something for themselves?” It’s the kind of work no one can do for you. It’s about cultivating what I call “deep interior resources” for learning, growing, healing, and transformation. The ability to cultivate those deep interior resources is grounded in the cultivation of attention and awareness and self-compassion. I would ask these doctors, “What percentage of your patients do you feel like you help?” They would say—and, again, mind you, this in 1979, when many doctors would spend up to a hour with a patient (now it’s, like, six minutes often)—“Well, I guess 10% or 15% or something like that.” I was astounded, and I asked, “Well, what happens to the others?” They said, “Either they get better on their own, or they never get better.” So when I said, “Hey, what if we set up this safety net to catch people falling through the cracks,” they said things like, “Well, I can think of a hundred people off the top of my head we could send tomorrow.” They were very open, and there was never any resistance to it. I never hid that we were going to be doing intensive training out of the Buddhist and hatha yoga traditions to tap these deep possibilities that all human beings have—at least in my view—or that these are arduous disciplines. I would say, “It’s stressful to take the stress-reduction clinic. It requires work. It’s like fighting fire with fire. It’s not dime-store relaxation methods to deal with cancer, heart disease, chronic pain, and issues of all sorts. No. We’re going to roll up our sleeves and dive into some of the deepest explorations that humans have ever done on the planet. It’s true this work has been done in monasteries on the other side of the Earth for twenty-six-hundred years, but we’re going to see if some of that isn’t valuable and valid here and now.” I never hid that it was from the Buddhist tradition, but I didn’t see the utility or skillfulness in Buddhist terms or reading Buddhists tracts and texts or anything like that. Again, it was all about making it as commonsensical as possible. I can imagine that part of the openness you encountered at the beginning had a lot to do with your patients having exhausted other possibilities, and so there was a willingness to try anything. Oh, yes. I’ve had many people say that. “Doc, I’ll try anything!” Physicians too. As a group, they tend to be incredibly compassionate and kind. When physicians feel like they’re not really helping someone, it’s tremendously stress-reducing for them to have an MBSR clinic in their hospital where they can send the people they don’t know what to do with! “Let them take care of these patients!” The interesting thing, though, is that we don’t take care of them: we’re working with a model whereby they take care of themselves. By following these simple meditation instructions that have to do with the cultivation of attention and discernment and wisdom and compassion, and we’ll just see what happens. At the time MBSR was being developed, though, it wasn’t like it is now—there weren’t yoga studios in every town, and meditation was something that was considered kind of a lunatic-fringe, hippie, New Age thing if people had heard of it at all. There were also a lot of misconceptions about meditation, like that it’s all about making your mind blank or things like that. Working through projections about meditation sounds like it might have been a bit of a project! Exactly. And yet, I must say: people took to it like ducks to water, and that continues to be the case. The world has shifted a lot since 1979—the number of scientific papers on mindfulness is growing exponentially every year, for instance. I was going to ask you about that. In 2007, one of the National Institutes of Health (NIH) found that twenty million Americans had used mindfulness or other meditation techniques for various health reasons during that year…. Wow! Is that so? I didn’t know that. Yeah. I think I first encountered that figure last summer when USA Today of all things ran a piece about mindfulness and medicine. The NIH has this National Center for Complementary and Alternative Medicine (NCCAM), which in the old days funded things at low levels, is now working on some pretty important research projects. The money for this kind of work is growing exponentially every year too. In addition, it seems like MBSR has helped spawn things like mindfulness-based cognitive therapy (MBCT). MBCT did grow out of MBSR. It’s tapping this other stream—or lineage, if you will—cognitive therapy. What I think the Dharmic element adds here is really profound. Cognitive therapy really has to do with thought substitution—recognition of negative and unskillful thinking, and substituting that. It’s a little bit like developing antidotes to particular mind-states in Buddhism. But the most radical practice is not to substitute one thought for another, or one emotion for another (which often trips people up because they haven’t made peace with the emotion or thought that keeps recurring), but to see thoughts as empty—to let thoughts come and go, and realize that that’s their intrinsic nature. They’re just events in our field of awareness, and we don’t have to believe them as true at all. That’s a radical stance, and has the potential to transform not only the practice of cognitive therapy but also take psychology to a whole other level. The deeper understandings of the Dharma on the nature of self, suffering, and the mind are being explored in FMRI studies and clinical applications of meditative practice, in fact. There is something extremely dynamical afoot here that has the potential to change the whole field of psychology, and for that matter the whole field of medicine. In large measure, we call what we do “mind-body” medicine, which itself was a radical concept ten or twenty years ago, but even beneath that we talk about it as “participatory” medicine. If you don’t get the patient to participate—tap deep agency within his or her own life, starting wherever they find themselves regardless of situation or diagnosis—then he or she is just a passive recipient of treatment. Participation means that they themselves become a scientist, so to speak, studying their own mental states, attachments, conditioning, and so forth. Without that, there’s really no potential for wakefulness or liberation. There’s been just so much growth and development of this work. The challenge as it becomes more popular is to make sure it’s not dumbed down. The original cast of characters all trained with Asian teachers in one tradition or another. Now, we’re one or two generations removed from that and those being trained in this work are just getting it from us or our students. They don’t necessarily have that same original connection. So one of the things we’re bending over backwards to do is define the highest level of practical, Dharmic standards that we can so this things doesn’t devolve into one more cognitive-behavioral intervention tool in your bag of tricks. It’s really an orthogonal tool that has do with a hidden and very profound dimension—if not multiple dimensions—of our humanity that are just not part and parcel of Western thought. Was pointing the field of medicine to those dimensions part of the thinking as you developed MBSR? Were you hoping that that could be a contribution of your work to the culture broadly? Oh, absolutely. That’s…[pauses]…that’s an interesting question. Why do you ask that question? I don’t know. I guess it just occurred to me that as you were working on developing MBSR you must have become aware of certain shortcomings or blind-spots in modern medicine, and how your work might help point things in a more holistic direction. I mean, initially the scale of your work was relatively small—you know, working with people with chronic pain issues. But obviously there’s this wisdom at the center that has these broad-spectrum applications we’re seeing come to fruition right now. I guess I just suspected that you at least were aware of the larger implications of your work from the get-go. Thank you for actually even intuiting that. In fact, it was very much part of my thinking from the beginning. This was not about developing some new therapy for a small number of people with one condition or another. My hope was that it would be possible to transform medicine and healthcare if this little thing that we were doing in the basement of the UMass Medical Center was successful. It actually came to me as a kind of vision after meditating for about ten years on what my Job—with a capital “J”—on the planet was. In other words, what did I want to do so much that I would pay to do it? What I wanted to do was bring together my work as a scientist and a Dharma practitioner in such a way that it would be really meaningful. Just doing molecular biology wasn’t cutting the mustard for me. There was a long time when I didn’t know what I wanted to do, but I did know what I didn’t want to do. Then at a certain moment on a retreat, it came to me—literally, in like ten seconds. It was the whole thing. I saw that if this were successful, it would have influence and spread out to hospitals around the country and around the world. It would have lots of different potentialities way beyond medicine or psychology. Indeed, that has come to pass. It’s not like I made any of this happen. Again, it’s all about participation and causes and conditions. My background and training were right, the timing was right… It’s a mystery. I can’t claim that I made it all happen, but on the other hand it wouldn’t have unfolded this way if I hadn’t put my energies into it in the various ways that I did. Part of it had to do with being trained at MIT under a Nobel laureate in molecular biology: I understood the power and importance of doing research. It was important to document what our patients were going through as best we could so that we could write the right scientific papers so that it would get out into the world. The result is now these tremendous scientists all over the world are studying MBSR and MBCT and other forms of mindfulness and compassion meditation and so forth in ways that are so profoundly personally satisfying to them. It’s like we’re creating new fields not just clinically but in research too—people are actually researching things that are in alignment with their own meditation practice. You’ve got these neuroscientists who are all meditators now, and who are looking at the brains of meditators and doing research that would have been inconceivable in 1979. It seems like your interest in these unexplored dimensions has inspired many of your fellow scientists to start exploring. Let’s not forget the economic piece of it: participatory medicine is going to be cheaper. We love to throw money at disease and health—often without understanding health. Most of the money goes into disease and understanding disease without understanding health, and how health is influenced by genes and development and also environment. There’s a lot of complexity here. What we’re doing here is in some sense about helping people to cultivate healthy minds in healthy bodies. There’s nothing particularly new about that, but it’s pretty new in our culture. We have to be careful not to do it in a way that idealizes meditation practice or sets a wildly unattainable goal. Instead, we want to recognize that the kind of liberation, insight, freedom, and selflessness that is talked about in the texts doesn’t exist in a cave or some past point in time, but that it’s here right now. This is where I think my Zen training is really valuable. It emphasizes non-attachment to name and form, but also Buddha and anything that you can point to. They call it direct transmission outside the sutras, as you know. That said, a lot of patients do go deeper into Buddhism and do retreat practice at centers around the country. It’s where they can go deeper into silence. But they also go to Catholic and Jewish retreat centers too. It’s universal. Who knows what the outcome of all this will be in a hundred years? My sense, though, is that it will be much more positive than not positive. On a very large scale, that seems to be continuing the participatory principal. Exactly. You know, I have a student named Tim Ryan who is a Congressman in Ohio. He understands all these things in a very deep way and has a very committed practice that takes him off on retreat to various vipassana centers despite his being a busy guy who’s up for re-election…and who’s young. So another whole dimension of this is the question of how we bring mindfulness and harmony—heartfulness, if you will—into the world. It’s not just the medicine of the body, but the medicine of the body Politik. A lot of that is, frankly, insane. So there is a very, very big scope to this, but at the same time it’s paradoxically and beautifully grounded in the very, very simple: just this moment, just this breath. And not making anything special out of anything because ultimately we’re not making anything at all. Non-fabrication and non-distraction. These are very, very powerful Buddhist practices that even if you’ve been meditating for many years…they don’t necessarily embed themselves in your DNA. Actually, many Buddhist teachers who come observe what we do in MBSR say, “My God…these people are better students in some ways because they don’t know anything. They don’t have the baggage of everything they know about and want from Buddhism. They just come with suffering, and the purity of that.” They’re just in pain and suffering, and paying attention to where we most don’t want to look: where it hurts. Then they ask deep questions like, “Who’s aware of this hurt? Who’s aware of this suffering? Who’s thinking?” This opens up those hidden dimensions of experience, and they realize, “Hey, my pain isn’t exactly me. A lot of it is thought-based and emotionally reactive. 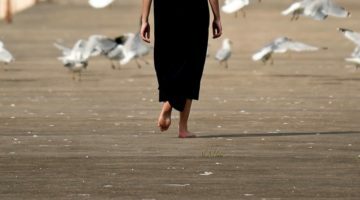 What if I uncouple the sensory experience of discomfort from all of the talk about how it’s killing me and ruining my life—all the affect and emotion about it?” We’ve had thirty-one years of experience now doing this and it has spread around the world. So when I talk at the benefit, it’s really aimed at offering these kinds of practices within the context of modern medicine and healthcare and psychology because this is something that you can do for yourself that is supremely important when you’re faced with your life taking a turn that you never, ever imagined or wished on anybody. “How do I work with this?” you might ask. Our message is: it is workable, as long as you’re willing to do the work. This interview is freaking iconic! I would type onomatopoetic cheering noises in praise of Rev. Danny Fisher, but I don't want to spend the rest of my morning doing MBSR on my feelings of embarrassment. So I'll just say, that rocked, Messieurs Zinn and Fisher. Some truly dharmic content that encourages deepening. Thank you! Thanks for sharing this, Danny! Very informative and inspiring. So glad to read this, it comes at a very timely moment for me. Mindfulness and Buddhism…what to teach, to who, when? Danny, this is amazing! You asked such great questions to draw him out! So very interesting! John Kabat- Zinn, whew! What a mentor. What an interview! Both men's questions and the answers brought me to tears of joy! I am 75 years old and thankful to be alive to absorbed the ideas and reality of what I've just read.